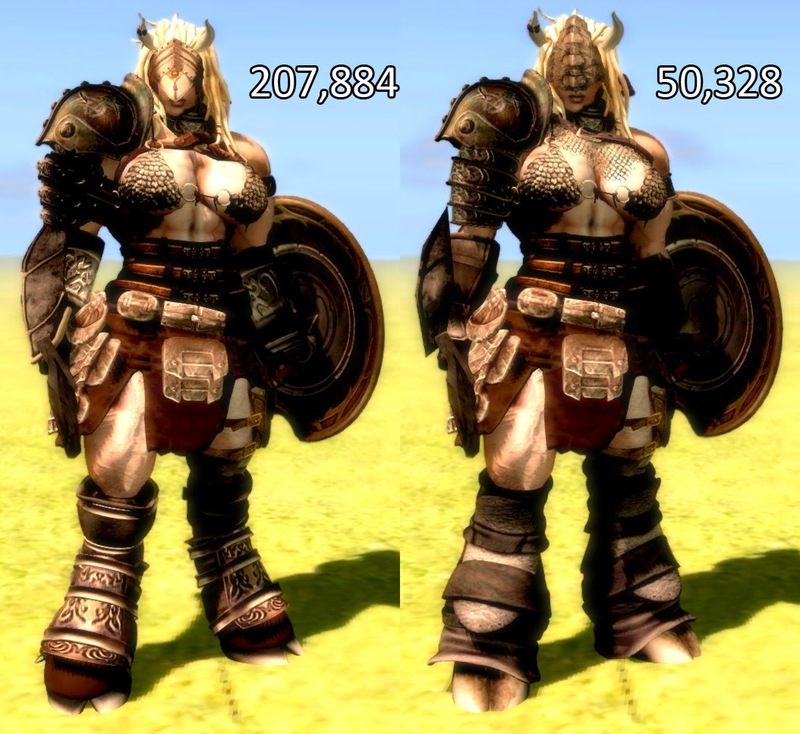 About two years ago I wrote an article showing how, with some modding chops, it was possible to drastically reduce avatar draw weight. I posted this image, showing how I cut my fantasy style minotaur woman avatar down to about a quarter of the original draw weight. Recently, I got the fantasy bug again and decided to dust off that old avatar and update it. I purchased the Nana fitness body from ::dev::, the creator of which was willing to sell me a modifiable version when I asked, which included hands and a mesh head using Bento, and had a couple of features I've been constantly astounded are lacking from other mesh bodies. Namely, the left and right arm are separate texture faces, meaning they can have two different textures, and the mesh hands are separate attachments! Because of this, I was able to put an underarmour texture on the right arm and while I used the included bento hand for the left arm, the armoured right arm instead has a heavy mesh glove. I've always been going for this ancient gladiator style armour look to my minotaur outfit and these details made it so much better. On top of that, there was a fitmesh bikini top I was able to mod into a scale mail top, I don't think it looks as good as the PFC scale mail bikini, but being fitmesh it fits perfect and I can use physics with it. And with the texture work I put into it, I don't think it looks bad. So lets put a draw weight to these improvements. As my avatar appears in these screenshots my draw weight is currently 34,740, which means I've made my goal of getting my base avatar, fully dressed, under 35,000. So what's my point with all of this? Mainly, I wanted to show that having a good looking, detailed avatar does not require a high draw weight as so many people believe. I also wanted to show that it's not mesh, that drives up draw weight, and that the newer mesh features like fitmesh and bento aren't to blame, either. I think it's important to say that I'm also not trying to say that optimizing content you've purchased in SL is easy. It's a lot of work, and you need to have some fairly advanced chops when it comes to modding. What it comes down to is that the biggest, perhaps only, reason any avatar in SL has a draw weight over 50,000 is because content creators aren't optimizing their work. So many content creators in SL either don't know enough about 3D rendering to understand why optimizing is important, or they're just lazy and don't want to put in the extra effort to optimize. Some believe they can't optimize without sacrificing quality, which isn't true. If content creators did optimize their work it would be easy for anyone to keep their draw weight low with off the shelf content, no modding required. I don't want to sound like I'm placing the blame solely at the feet of content creators, either. Many people came to SL to have fun and discovered that they enjoyed creating content. Everything they know they learned over the course of creating content for SL, and let's face it: Linden Lab could do a lot more to encourage better content creation habits. LL ignores, or is ignorant of, the impact heavy texture use has on framerates. LL placed no real restrictions on the render weight of avatars. None of the tools in SL really try to encourage good building habits because the Lindens themselves never bothered to learn about content creation. Of course now we have the "jelly dolls" feature which renders avatars with excessively high draw weight as a brightly coloured pixel figure and while some just turn this feature off, a lot of people do keep it on in order to boost their framerates, so there is some incentive now towards having a lower draw weight. Content Creators: Start optimizing your work. Reduce your texture use. Don't release content bloated with hidden surfaces. Utilize LOD. Modders: Only buy moddable content then look for all the ways you can reduce the draw weight of that content. Unlink hidden pieces. Replace oversized textures. Set alpha textures to masked instead of blended. Check out that previous article for more tips on how you can reduce the draw weight of items you've purchased. Lindens: If you're reading this, start encouraging your userbase to be smarter about content creation. Hire someone who knows how all this works and can help your programmers create tools that discourage bad habits and push people towards creating better content. Don't be afraid to be firm where you need to, like finally putting hard restrictions on avatar draw weight. You can tie them to new features, like Bento, so you're not breaking old content. Ultimately, you're the only ones who can solve SL's performance issues by addressing the issue of bloated, unoptimized content. Everyone Else: Just keep enjoying SL. Like I said, reducing draw weight isn't easy and it's unreasonable to expect everyone to learn how. So don't fret about it. That said, when you buy something, take a moment to see how it affects your draw weight. If it causes your draw weight to go way up, make sure you tell the content creator so that they know customers are expecting low draw weight content. Let them know you don't want to be a jelly doll on someone else's screen.